We make your real estate marketing quick, easy and affordable. Interesting articles focused on real estate. Detailed and accurate, so you always look good. Economical even for small contact lists. No long term contracts. Cancel any time. We write, you review, we send. It's hands-free! No technology skills needed at all. We customize your account FOR you. 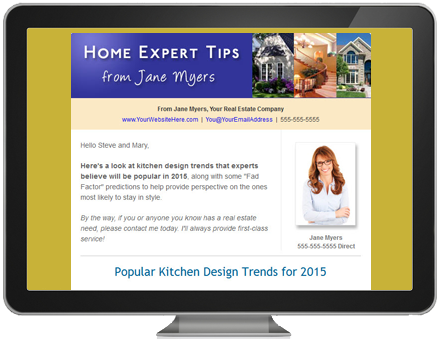 "My e-newsletter is the most effective marketing tool I've ever used."